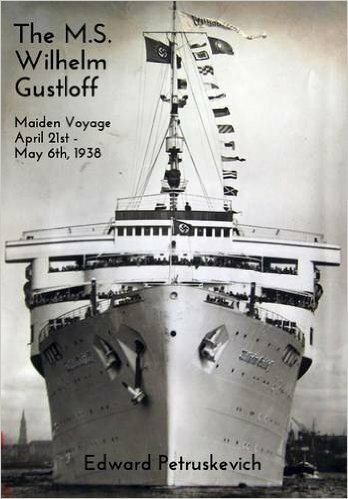 On 30th January 1945 the liner MS Wilhelm Gustloff was making her way from Gotenhafen packed with thousands of Nazi officials, refugees and armed forces personnel fleeing the Soviet juggernaut sweeping into the Reich. The ship was being tracked by the submarine S-13; commanded by the 32 year old Captain Alexander Ivanovich Marinesko. Despite being a very successful submariner, he was facing disciplinary proceedings due to a fondness for booze that didn’t fit into the ideal propaganda image of a Soviet hero, but he was good at his job and lined the S-13 up to attack the big ship. The Wilhelm Gustloff was not a hospital ship and was armed with anti-aircraft guns making her fair game within the rules of war. Three torpedoes did the trick and the liner took around forty minutes to go down. It is estimated that nine thousand four hundred people died out of the ten and half thousand on board. Five thousand of them were children. To say it wasn’t a disaster would be wrong, but it was war and hundreds if not thousands of other tragedies for individuals, families and communities took place even without including the despicable crimes of the Nazis. The crew of S-13 in no way merit trial by hindsight. Sinking the Wilhelm Gustloff and other successes made Marinenko the most successful submarine captain in the Soviet Navy, but he did not escape censure and wasn’t rehabilitated until just before his death from cancer in 1963. He was posthumously awarded the Hero of the Soviet Union during the tenure of Mikhail Gorbachev in 1990. The sinking remains the worst maritime disaster in history but the Titanic and other much-publicised losses tend to shield the Wilhelm Gustloff from greater scrutiny. But the circumstances of the disaster have attracted growing interest and this book by Edward Petruskevich is a case in point. The author is part of a group of historians who have been building a huge archive of documentary evidence about the full life and service career of the liner with the intention of getting the whole story in context. Needless to say, the Internet age has provided a massive impetus. Dramatically speeded up communications and the ability to share information and artefacts have been spurred by the power of the web. This had led to the creation of an impressive online museum open to all and sundry. 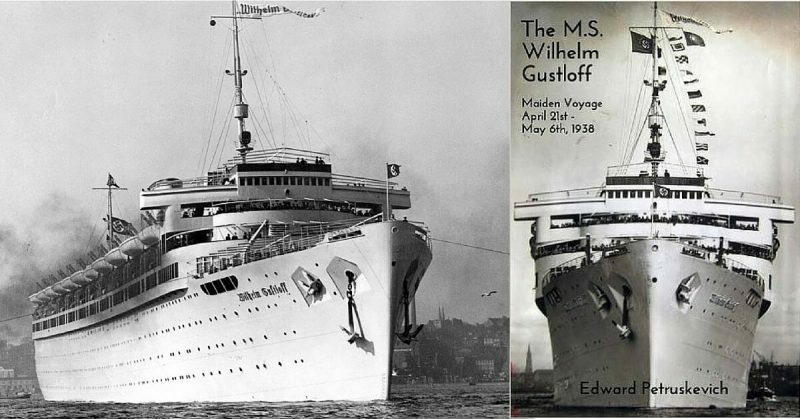 This brings us to this book that looks at the maiden voyage of the Wilhelm Gustloff in 1938. She was built for the German Labour Front but served the Kraft durch Freude organisation – Strength Through Joy. As such she provided a classic propaganda image for the Nazis who wasted no opportunity in showing her off. The book offers an account of the voyage and we see events through the journal of a passenger, Elisabeth Dietrich. One of the events given prominence is the untimely death of the ship’s unfortunate captain, Carl Lübbe, who died of a heart attack. The event could allow us to assume the ship was marked by tragedy from first to last. Much of the book is taken up with the ephemera of the Wilhelm Gustloff together with a good amount of Nazi media coverage and official reports. This is all very interesting and some of the imagery of badges and liveried items from her remind me of another lost ship, the Arandora Star, a former Blue Star line passenger ship torpedoed by the famous Gunther Prien in 1940 while carrying Italian and German internees from Britain to Canada. Around nine hundred people perished in that disaster and many of the crew were friends of my grandfather, a one time Second Engineer of the vessel whose keepsakes from the ship are treasured by my family. What did I say about tragedies? It is fair to say this is an unusual book. It has all the elements of a curio, but the author and his colleagues intend it to form part of an in depth history of the ship and I suspect they hope this might free her from the stigma of being permanently identified by her awful finale. I like books like this because self-publishing offers the freedom to set ones own parameters and just do it how you want without interference. While that can lead to all manner of problems, in this case I think Mr Petruskevich has got it right. I will be honest and say I doubt this book would reach a very wide audience. But my regular theme of making capital of all the so-called smaller stories usually ignored by elite writers and publishers is validated here. Anyone interested in ships and maritime history will find much to divert them and future volumes promise further insight into the life of a ship best known for the manner of her death. The book also acts as a flag waver for the kind of project the author and his friends have undertaken. It’s all good stuff and history produced with skill, enthusiasm and not a little love is the best kind. If you fancy something different, look no further.